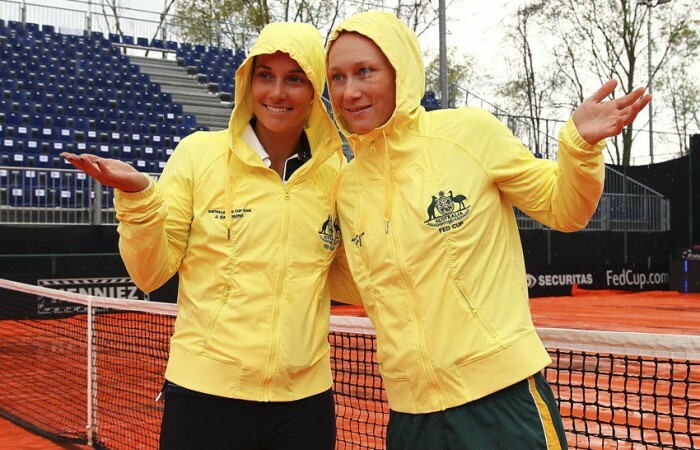 Australia and Switzerland face the unusual prospect of playing matches simultaneously in a bid to finish their rain-soaked Fed Cup tie in Chiasso on Monday. The crucial World Group Play-off tie is still yet to begin after both allocated competition days were washed out due to dour conditions in the southern Swiss city, a first in the competition’s history. The best-of-five tie will spill into a reserve day on Monday and both teams are eager not to extend until Tuesday with several players due to compete in tour events this week. Officials have called a 10am local start time on Monday (1800 AEST) for both opening singles matches, which could even be played side-by-side on practice courts. 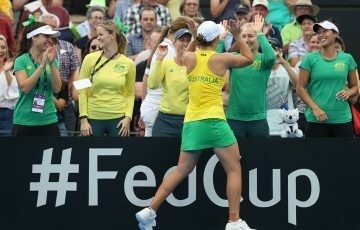 Australian spearhead Sam Stosur is drawn to face Swiss No.2 Stefanie Voegele while Jarmila Gajdosova will face top-ranked Swiss Romina Oprandi. The reverse singles would be held later on Monday before the doubles, if required. French Open contender Stosur had planned to fly to Stuttgart on Monday ahead of this week’s WTA event. A planned strike by German air carrier Lufthansa could also complicate matters but match referees are in contact with WTA officials to accommodate changes in the players’ schedules. The prospect of playing two matches in a day could also be a concern for Stosur, who is battling a troublesome calf. A three-hour break in the weather early on Sunday afternoon had raised hopes play would begin, with grounds staff working tirelessly to prepare the soaked Tennis Club Chiasso main court for action. But the rain returned just as the players arrived at the venue. With the main court under cover, staff began readying a side court in the hope Stosur’s match could begin, but it was deemed too dangerous and play was abandoned at 6pm.